Another week down. They go so fast. This week was even extra fast as we had our Pumpkinland trip on Tuesday. So, in actuality we only had one day of school. Pumpkinland was lots of fun. When we arrived at school it was beautiful, but Mother Nature had other ideas for our actual trip. By the time we got to the place, there were clouds and occasional raindrops--and cold! But, the kids loved it. We went on a hayride, through a corn maze, had a great story about Spookley The Square Pumpkin, got a goody bag, then headed to the pumpkin patch to pick out a great pumpkin. It's always fun to go on a trip. Thursday was extra busy then with trying to explore our color, make a Halloween craft, and make sure we practiced songs for our show. We did it all, how? I'm not sure. Here is a project I have been doing since I got out of college. It has been around for a long time, but it is always so cute when finished. Also, this is our first "organized" cutting activity of the year. There have been scissors out at different centers, but this is the first time we are actually going to cut to create our craft. I am always amazed at how many of the children can only cut if their tongue is sticking out--sometimes the mouth is even opening and shutting with the scissors. Who knows, maybe that's how I do it too! 12 x 1 1/2 strip of black construction paper. First take the orange paper and give the children a black crayon. Ask them to draw a jack-o-lanterns face on it. For my three's I usually have a paper drawn with some different shapes so they may copy if they like. Many of them always tell me they don't know how to draw a jack-o-lantern's face, so I have the shapes there for ideas. After the face is drawn fold the paper in half horizontally. The children will begin cutting on the fold and cut up about 3 inches--not going all the way to the edge. If they cut it all the way to the edge, the whole strip will come off (have tape ready). You want to keep the paper whole. 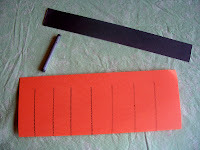 If you would like, you can mark the paper with lines for the children to cut on. Sometimes I find they stress too much with trying to follow the line. So I hold the paper and point to where they should start cutting and then tell them when it is time to stop. 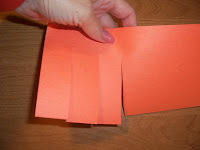 You want to cut these "stripes" all the way across the paper. After the paper is cut, open it up. Make a cylinder out of it and staple the edge together. Finally attach the black strip handle. I always give them a little bounce action to loosen them up. These are great to make if you're having a Halloween party, they are easy and look great hanging around. I'm a pushover for a great rhyming book with repetitive text and tongue twisters. For example I love "Fox in Socks." So this book is another favorite of mine. 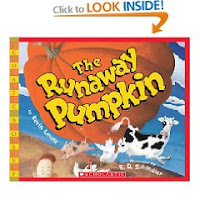 The book is "The Runaway Pumpkin," by Kevin Lewis, illustrated by S.D. Schindler. This is the story of some children finding a big pumpkin at the top of a hill. As they try to retrieve the pumpkin it starts rolling down the hill. The pumpkin crashes his way down the hill and the characters in the story have "dreams" of some heavenly pumpkin food. I always loved making these lanterns when I was a kid! I'll have to do this with my girls. Thanks! !